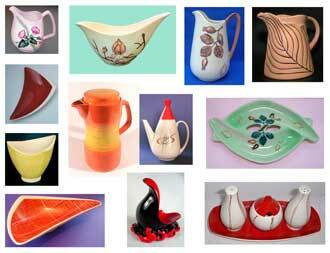 Carlton Ware - Types of Ware 1890-1990. 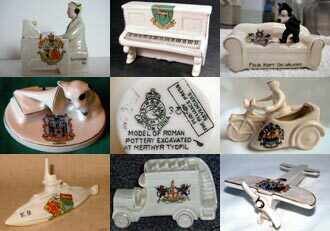 For almost 100 years Wiltshaw & Robinson, the makers of Carlton Ware, produced an extraordinary range of earthenware and china at its Copeland Street works in Stoke-on-Trent. Here we briefly describe and show most of the main categories, roughly in chronological order. Not long after its formation, about 1890, Wiltshaw & Robinson introduced a highly successful range of earthenwares, now called Blush Ware. This name aptly describes the delicate pastel shaded backgrounds to patterns, either printed or freehand. 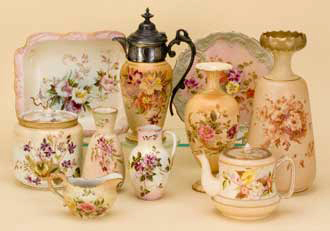 If you would like to see a range of Blush Ware patterns named by the Pottery then click here. If you would like to see more detail and examples, then click here. Wiltshaw & Robinson was one of the first of many potteries to follow WH Goss's lead in the production of Heraldic Souvenir China emblazoned with heraldic crests. W&R introduced their models around 1903. 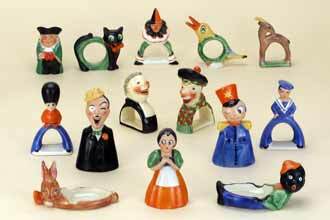 Production of this fascinating range of miniatures	continued well into the 1920s. Initially W&R based its models on ancient artifacts found in museums, but within a short time, offered models of an entertaining	and humorous nature. Suffragettes, modes	of transport, latest inventions, seaside themes and	popular songs also provided inspiration to the pottery. The 1914-18 war brought about the introduction of many models of a military nature. To commemorate the centenary of the beginning of the war during 2014 we published a series of 12 articles on Carlton Heraldic China related to the conflict. Click on the image on the right to view. Best Ware was the name given on the works for the more highly decorated wares, usually employing elaborate printed and enamelled patterns. The highly skilled techniques	needed to make them had been established early on with the Blush Ware patterns, the Best Ware of their time. Often Best Ware patterns were underglaze painted, as well as using onglaze enamels and lustres, gold printing and raised enamelling. The most popular were the many Chinoiserie patterns such as MIKADO, TEMPLE and the elaborate CHINALAND. 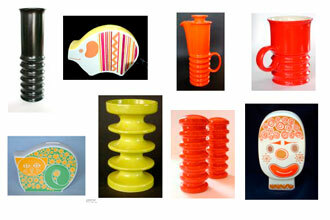 Perhaps, the most extraordinary Best Ware is from the Art Deco era with archetypal patterns such as FAN, BELL and JAZZ. Such exotic decorations will never be created again, because of the high cost of production and loss of expertise. Salad Ware's considerable popularity generated the revenue that enabled the extravagances of the highly original and expensive Best Ware patterns. All was expertly modelled and hand painted in attractive colours. Today, we divide this wide range into Floral Embossed and Fruit Embossed wares, although on the works it was all known as Salad Ware, primarily because the first of these ranges was the highly popular Lettuce & Tomato, variants of which remained in production for more than fifty years. Predominantly, Handcraft was decorated using the palette of colours shown in the picture on the right, though eventually there were quite a number of exceptions. W&R introduced this range c.1928, as a response to the fashion for freehand painted decorations. Around this time, many other British potteries offered modern freehand painted wares, such as Poole Pottery, Grays Pottery, Susie Cooper and Clarice Cliff. Such was the zeitgeist. 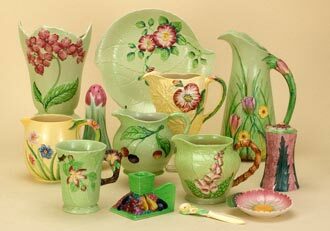 Coloured Ware was the name the pottery gave to a range of novelty wares first introduced in the 1920s. All were executed with a wonderful sense of humour. 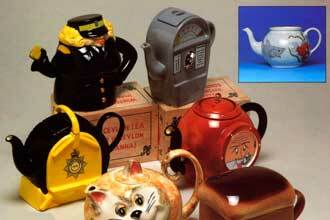 Novelties were to become another hallmark of Carlton Ware. 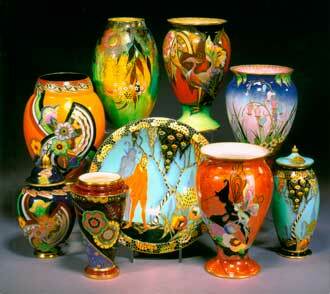 It was widely acknowledged throughout the pottery industry that Carlton excelled in their production. In 1928, as a means of expanding its already extensive range of wares, Wiltshaw & Robinson bought the nearby Vine Pottery, previously the china works of Birks Rawlins & Co.
Carlton Ware had already established itself as makers of fine earthenware tea and coffee sets, so the diversification to china versions was a natural progression for the forward looking pottery. Initially, Carlton Ware continued to fulfill orders for Birks Rawlins patterns, most of which	were of a traditional nature, but within a short time many new and modern designs were introduced. The earliest known Advertising Ware dates from about 1900 and took the form of match holders and strikers for companies such as Bryant & May and Burton Ale. From the 1930s onwards John Haig & Sons, distillers, became big customers using ware to advertise their whisky in pubs and hotels with specially modelled ashtrays and water jugs. Others brewers and distillers took advantage of the skills at Copeland Street, most notably Arthur Guinness, Son & Co., especially with a range or bar ornaments. These were based on John Gilroy's animals and zoo keeper that had he first created for Guinness adverts. Alas, Master moulds for these charming figures have ended up in the hands of the unscrupulous and fakes abound. 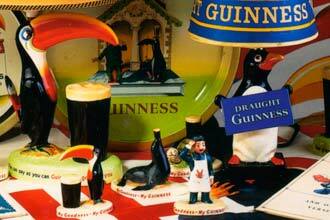 See our Guinness fakes pages to see these and more. During the post war period many pottery designers looked towards Scandinavia for inspiration and Carlton Ware was no exception. Fluid and freeform shapes were the order of the day. 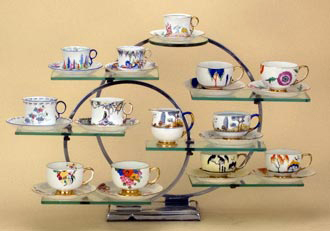 Windswept, a large range of tea, coffee and table ware, is a good example. The Triform and Shelf ranges are others employing the fashionable fluid shapes of the time. Even Salad Ware was given the treatment with ranges such as Convolvulus, Magnolia and Orchid, all of which were popular and used new background colours. 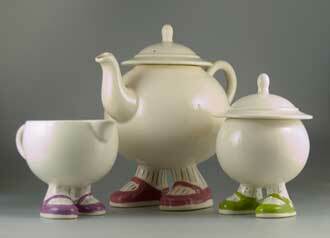 Two years After Cuthbert Wiltshaw's death in 1966 Carlton Ware was bought by Arthur Wood & Sons. 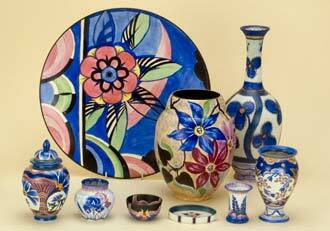 The printed and enamelled Best Ware patterns that had generated so much prestige for the pottery were discontinued. They were replaced by a a much smaller range of less costly lithographic decorations,	similar in appearance to their predecessors. New Salad ware lines were introduced in the form of Canterbury, New Buttercup, with its variant Somerset. The new owners also looked to the past for inspiration with the resulting remodelling of Apple Blossom, to give us New Apple Blossom, and a range of flow blue decorations on traditional shapes. In 1974 Roger Michell and Danka Napiorkowska approached Carlton Ware to make pottery under license for their Lustre Pottery. And so began the manufacture of the charming and amusing Walking Ware at Copeland Street. It's enormous success led to the introduction of similar ranges such as RJS (Running, Jumping and Standing still!) and Big Feet. The popularity of Walking Ware stimulated the introduction of many other amusing ranges by Carlton Ware's in-house designer Pam Souch and a large number of	more highly original and quirky designs entered production. Disastrously, in 1987 County Potteries, a holding company, bought James Kent and then Carlton Ware. Two years later, the directors put Carlton and Kent into voluntary liquidation. County Potteries went into compulsory liquidation shortly afterwards. Eventually, Paul Thompson, one of the directors of Kent, Carlton and County Potteries, was disqualified from running any company. The loss of so many jobs was a tragedy for the Potteries and the many former employees, who had dedicated their working lives to Carlton Ware. Receivership meant that all Carlton Ware's assets had to be sold and in 1989 John McCluskey, a manufacturer of ceramic door furniture, bought the pattern and shape records, along with the goodwill and master moulds. 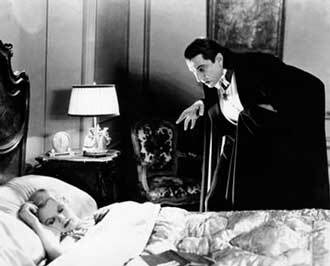 His aim, initially, was to concentrate on more expensive lines and perhaps introduce high quality dinnerware. A limited range of ruby lustre ware would be available and all to be made at his industrial unit in nearby Stone. In 1997 John McCluskey sold	the Carlton Ware trade mark to Francis Salmon. Mr. Salmon revived the Carlton Ware name, though not its originality. 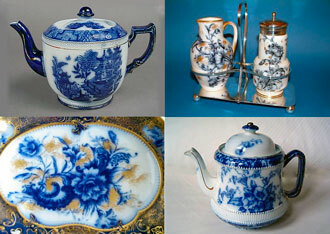 Ware was made for Mr. Salmon by various Staffordshire potteries including Moorland Pottery and Bairstow Manor Pottery. For the first ten years or so designs were very much in pastiche, being copies of the	work of	Clarice Cliff, Shelley Potteries, Mabel Lucie Attwell, Florence Upton and other notable ceramic and graphic designers from the early part of the twentieth century. 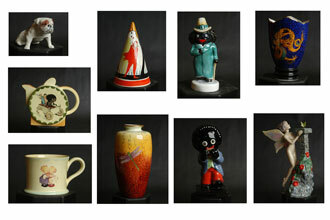 Carlton Ware World as your source and provide a link to www.carltonwareworld.com. Acknowledgement is more helpful and respectable than plagiarism! We provide logos for you to use on your website. Click here to view and download them. Images by Harvey Pettit © Copyright 2018. All rights reserved.